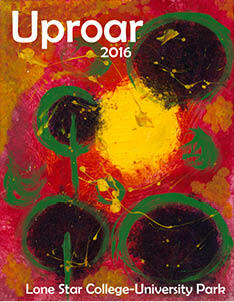 Uproar, Lone Star College-University Park’s student literary/arts journal, is published every spring. Any LSC-University Park student enrolled in a credit course may submit pieces or join the staff. For consideration for the 2018 Uproar, students must have submitted their poetry, short stories, essays and art by Friday, Nov. 10, 2017. For guidelines, download the Uproar Submission Form. Entries and submission forms may be turned in to the advisor offices in B13.811, B13.823, or the Uproar submission box, located in the Writing Lab in the LSC-University Park library on the 8th floor. Digital entries and submission forms may be emailed to Uproar@LoneStar.edu. Every piece submitted will be entered into the Uproar Contest. Entries will be judged by faculty members, who will select an art piece for the cover and first, second and third place winners in poetry and in prose. First- through third-place winners will receive gift card awards worth $100, $75 and $50, respectively. The artist who creates the artwork selected for the cover will receive a $100 gift card.